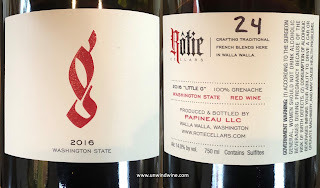 One of the highlights of our Walla Walla Washington Wine Experience 2018 was a visit to Rotie Cellars and discovering their Rhône Style red blend wines. 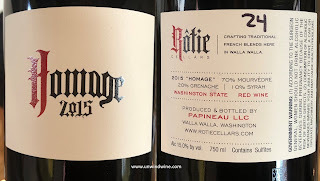 Their mission is to craft traditional Rhône Blends with Washington State fruit. In the words of Sean Boyd owner, winemaker, "this means lower alcohol, less ripe, less oak, balanced, finesse driven, mouth coating wines". 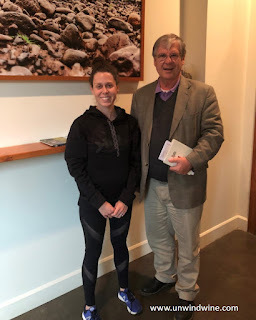 We were hosted at their Walla Walla tasting room in the city centre by Madde Richards (right), head of hospitality and sales who keeps busy overseeing the myriad of details in creating a brand, building distribution and running the marketing operations. Note the Rocks District 'soil' in the picture behind us, and below. Maddie hails from Dallas and spent time in Chicago before returning West where she enjoys horseback riding and camping with her husband, daughter and their pair of large dogs. 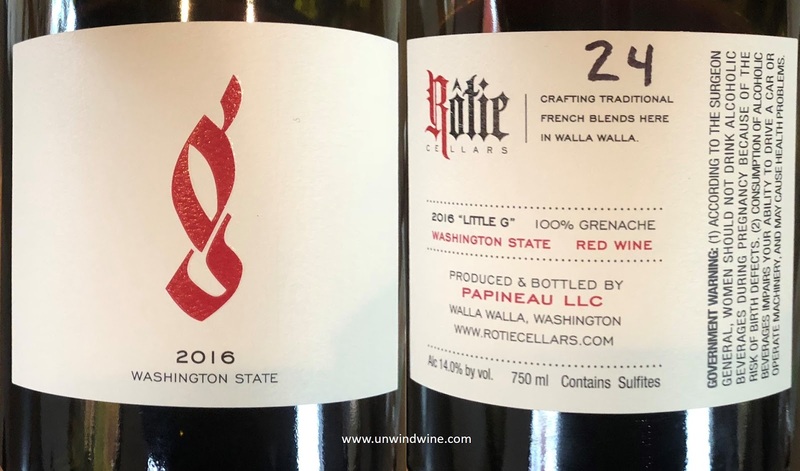 Like many of the Washington State producers, due to the remoteness of the Central Washington and Walla Walla regions, Rotie have a tasting room in Seattle. 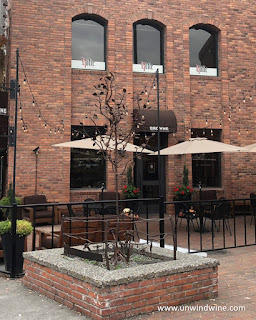 They also have a tasting room in downtown Walla Walla which is coming of its own as a major wine producing area and is becoming a tourist destination accordingly. In the Walla Walla AVA, in the southeastern corner of the state, the number of wine producers has grown to over 150 and the total vineyard acreage has grown from 800 acres in 1999, to 1,300 in 2011 and nearly 3,000 in 2017. 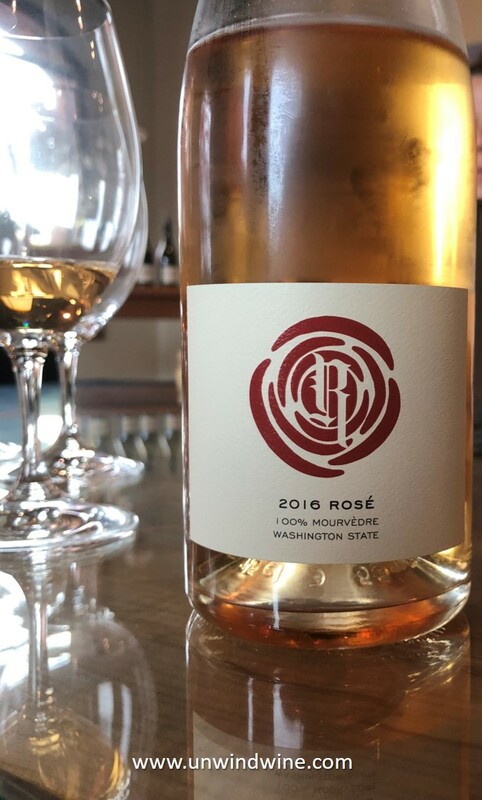 We knew going in that Washington State was producing some world class wines sourced from local fruit in both Rhône and Bordeaux varietals and styles. Rotie epitomizes classic Rhône wines in the styles of both the northern and southern Rhône wine regions. The Rhône is one of the major rivers of Europe flowing from the Swiss Alps to Geneva, then forming the border between Switzerland and France, running west to Lyon in the center of France, then flowing south through Avignon in the Southern Rhone wine region, emptying into the Mediterranean west of Marseille. The northern Rhône river valley experiences a mid-European climate with harsh winters but warm summers. 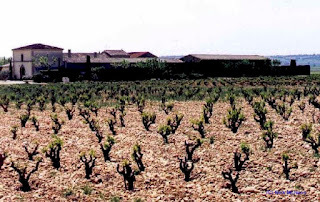 The southern Rhône region has a more Mediterranean climate with milder winters and hot summers. A geologic feature of the region is the large pebble gravelly soil which absorb the heat of the sun during the day and serves to keep the vines warm at night. Before this trip, I did not realize or appreciate how similar the area is to the classic wine appellations of the Rhône. The terroir soil composition in the Rocks District of Milton Freewater, the newest appellation in Washington State that straddles both sides of the Washington Oregon border, is amazingly like that in the Southern Rhône appellation of Chateauneuf du Pape (right). The name Rotie conjures images of the Northern Rhone wine district Côte-Rôtie where the vineyards are comprised of the steep slopes facing the river with rocky soils that form stone walls. Rotie sources grapes from the well known prime appellations' sites with distinctive terroir across the state. Starting with the 2015 vintage, their Northern Blend is 100% Rocks District fruit from their 18 acre Estate vineyards - with 7.5 acres coming on line in Grenache, another 7.5 in Syrah, and a half acre in Viognier. 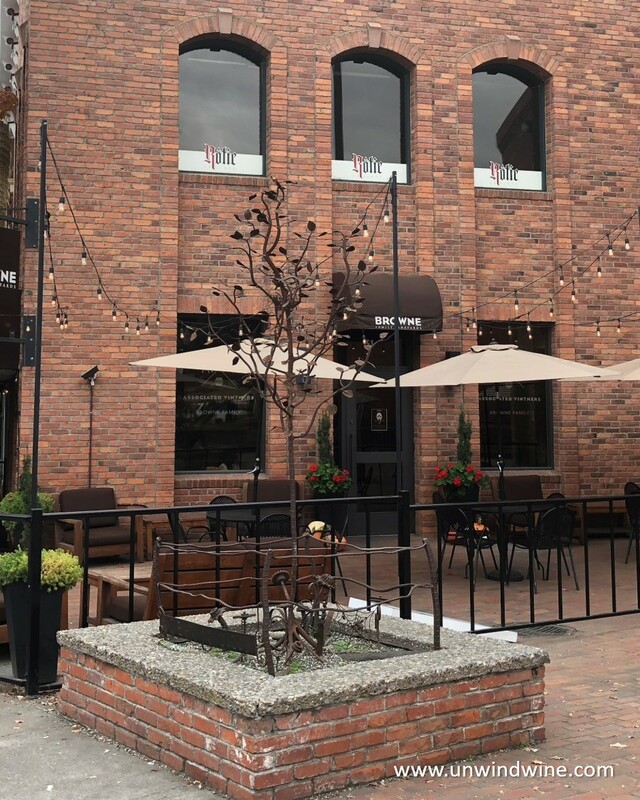 The Rocks District of Milton Freewater is the country’s newest AVA. Wine Spectator calls the AVA “perhaps America’s most distinctive example of terroir." Rotie are building a winery with a tasting room at the Rock's District estate location. The unique riverbed of cobblestones and pebbles is as much as two hundred feet deep, formed 12,000 to 15,000 years ago from massive floods that swept through the region caused by ruptures in the ice dam that held Montana's glacial Lake Missoula. The Rocks District is a 12-square mile alluvial fan of 3,770 acres. Rotie Cellars is the vision, handiwork and artcraft of owner winemaker Sean Boyd. He started his career in oil and gas exploration utilizing his degree in geology. He pursued his passion for wine working from the bottom up learning the craft and business first at Waters Winery in 2004, and eventually stepping out on his own in 2007. Sean's academic studies and early work in geology prepared him well to produce authentic wines using natural techniques and methods to reflect the terroir or sense of place that results from the vineyard sites where the grapes are grown. He believes great wine happens mostly in the vineyard, and that his main job is to stay out of nature’s way. 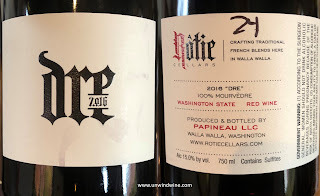 The result is Rotie wines that reflect the style that Sean loves to drink — French-style Rhône blends. This is a blend of 65% Viognier, 18% Rousanne and 17% Marsanne. 800 cases are produced. This is straw colored and light medium bodied, it opens with pineapple accented by citrus fruits turning to hints of apricot and honeysuckle and finishing with notes of peach with a nice bright crisp acid finish. This has received 93 points by Wine Advocate. This is a blend of 70% Grenache, 20% Mourvedre and 10% Syrah. Fruit for this is sourced from Alder Ridge. Garnet colored with medium body, it resembles the highlights of a Southern Rhone from Gigondas or Vacqueyras (lesser appellations to the better known Chateauneuf-du-Pape - known for Grenache based wines) with accents of white pepper on the black currant, black berry and raspberry fruits. The 2015 of the label was awarded 94 points by Wine Advocate. This is a blend of 95% Syrah and 5% Viognier. This 2015 label was awarded 95 points by Wine Advocate. This is a Grenache sourced from the Mary Hill Winery Rock Quarry land in the Columbia Gorge in western Oregon. This is smooth and polished - a Grenache wine discovery for folks not familiar with the varietal. Garnet colored medium bodied with bright vibrant raspberry and currant fruits accented by tobacco leaf and black tea notes. Like the Southern Rhone Blend, this is a blend of select fruit - 70% Grenache, 20% Mourvedre and 10% Syrah. This is dark inky blackish garnet colored, full bodied, structured but nicely balanced black berry accented by blue fruits with tones of anise and dark mocha chocolate. This is 100% Mourvedre. I've never experienced or appreciated what Mourvedre is capable of or how it contributes to the blend in the CDP (Chateauneuf du Papes). This is remarkable and a case study in this varietal. What a discovery! Is this to CDP what Petit Verdot is to Bordeaux? Dark, full bodied, structured and muscular with black berry and boysenbarry fruits on layers of tobacco, spice box and white pepper on a long lingering tongue coating finish. Several of these wines are allocated and available or preferenced to Club Members. In Chicago, we've sourced these wines from Vin Chicago. 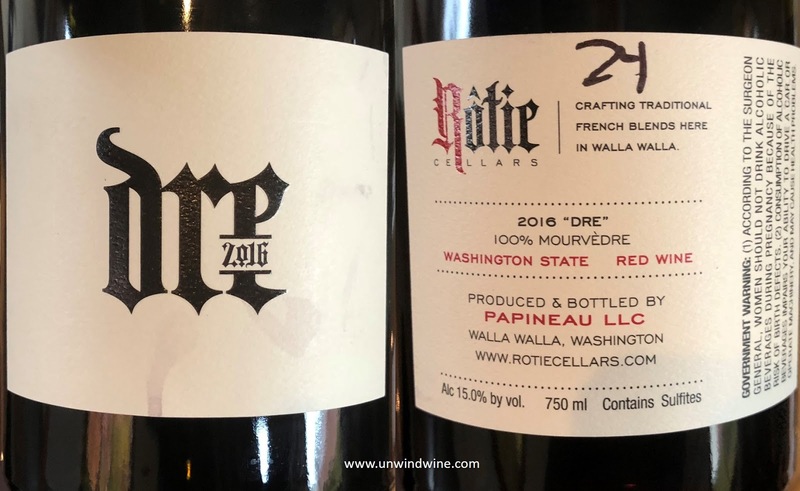 With limited production and increasing notoriety for Washington State, Walla Walla, and the Rocks District - get on the bandwagon and the Club to source these wines while they are available. And acquire and store these for future enjoyment, and before the prices escalate as they become more well known and more in demand. 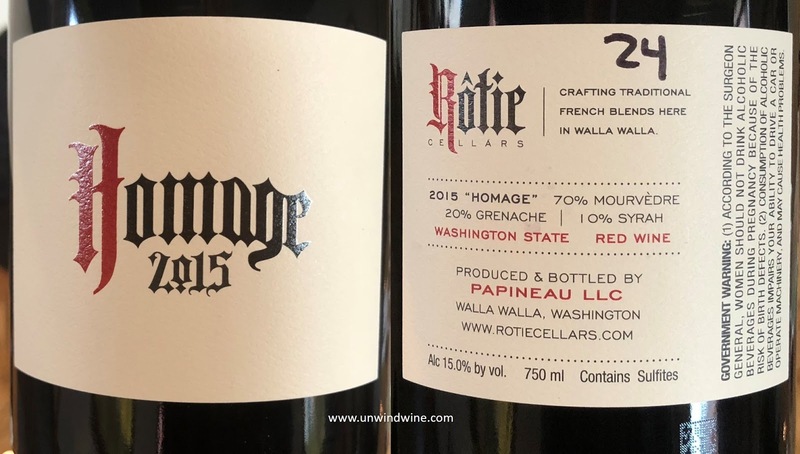 NOTE that Rotie are offering LIFETIME price protection on allocated Club wines at the price in effect when joining, and $25 flat rate shipping in the 48 States, as well as complimentary tastings. We look forward to further explorations in Rotie wines. Watch for them, and pick them up while you can.